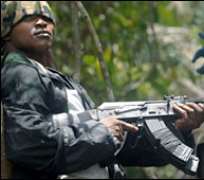 In a bid to fully harness their potentials into productive ventures and integrate them back into the society, repentant militants in Bayelsa State in Nigeria are to be trained in Ghana. Already the state Coordinator of the Presidential Amnesty Implementation Committee, Rev. Obegha Julius Oworibo, has travelled to Ghana to secure an institution where the repentant militants would under go training in various vocations. The training programme, Vanguard learnt, is part of the state government's Triple 'E' scheme of Empowerment, Engagement and Enforcement, mooted before the presidential amnesty came into being for militants in the Niger Delta. Secretary to Bayelsa State government, Mr. Gideon Ekeuwei, disclosed this in Yenagoa against the backdrop of protest by some former militants in the state over alleged non-payment of their allowances by the authorities. According to the state government scribe, the state coordinator of the amnesty programme, Rev Oworibo, who incidentally is a permanent secretary in his office, had to travel to Ghana to make arrangement for the training of the repentant militants. He expressed optimism that in no distant time, the state would once again assumed its toga of oasis of peace in the Niger Delta. Secretary to the state government described the perceived disagreement between the ex-militants and their respective leaders as purely internal matters. He said the protest was not unusual, adding that the development was expected, especially when it had to do with the issue of disarmament. He noted that other countries of the world in similar situation were experiencing the same problem. “What they (militants) may have expected may not come out as expected. This is not to say that government has failed,” he said. Prior to the amnesty offer and the recent arms haul recorded in the predominantly riverine state, Bayelsa is renowned as the hotbed of militancy and kidnapping in the Niger Delta. It also had the highest number of armed militant camps in the troubled region.